TYRONE PHILLIPS CHICAGO SHAKESPEARE: Chicago Shakespeare in the Parks production of A Midsummer Night’s Dream, Red Velvet, King Charles III. 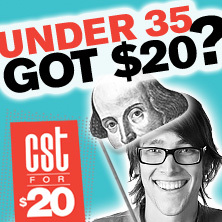 CHICAGO: An Octoroon, A Doll’s House, Genesis, The Brothers’ Size (Definition Theatre Company); George Orwell’s 1984 (Steppenwolf Theatre Company); Stick Fly (Windy City Playhouse); Father Comes Home From The Wars (Goodman Theatre); Saturday Night/Sunday Morning (Prologue Theatre Company at the Steppenwolf Garage). REGIONAL: Assassins, A Christmas Carol, A Raisin in the Sun, understudy in The Mountaintop, understudy in Clybourne Park (Milwaukee Repertory Theater). FILM: Gimmick, Boss, Divergent, Fare Thee Well. TELEVISION: Chicago Justice (NBC); McDonald’s Mario-Kart Happy Meal commercial; DiGiorno's Don't Settle commercial. EDUCATION/ TRAINING: BFA in acting, University of Illinois Urbana-Champaign; Shakespeare’s Globe; emerging professionals resident, Milwaukee Repertory Theater. Mr. Phillips is the founding artistic director of Definition Theatre Company and former artistic assistant at Writers Theatre. He was recently selected as one of Newcity Stages's Players - the 50 leaders of Chicago’s theater, dance, opera and comedy culture of 2018.